By Default, SCVMM copies an ISO from the Library share to the directory of the VM. This is desired behavior for the most part because it eliminates VM failures if the ISO directory becomes un-available, and it also reduces network bandwidth and Disk I/O during the use of the CDROM. Configure the VM to Share instead of Copy the iso. NOTE: This is only supported with SCVMM R2. Open Computer Management or Server manager and find the Virtual Machine Manager service. 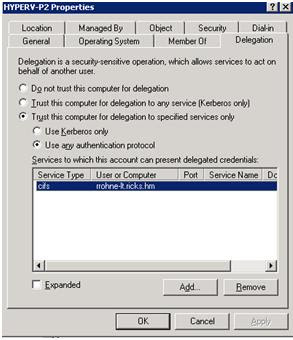 In the Add Services dialog box, click Users or Computers, select each VMM library server that stores ISO image files. In the Available services list, select the cifs protocol for each of the VMM library servers, and then click Add. Right-click the virtual machine, and then click Properties. Click the Hardware Configuration tab. In the left pane, under Bus Configuration, click IDE devices, and then select the IDE device that is being used to capture the ISO image file. Under Capture mode, select Existing image file, and then use the Browse button to select the shared ISO image file in the VMM library that you want to use. 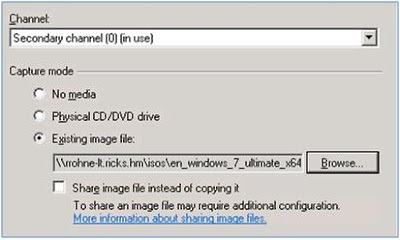 To share the image file from the VMM library instead of attaching a copy of the image to the virtual machine, select the Share image file instead of copying it check box. NOTE: Do not keep the ISO mounted when it is not in use. Keeping the ISO mounted may result in a failed VM.